For the German Navy, facing war without its own aircraft carriers, the helicopter seemed promising as an observation platform and anti-submarine weapon carrier that could launch and recover from a platform on a small vessel. 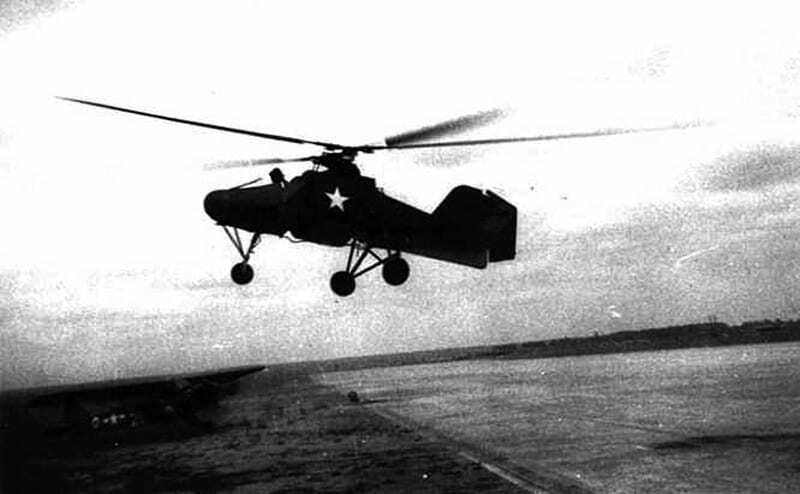 During the 1930s Kriegsmarine officers had noted the U.S. Army’s experiments with the Kellet KD-1 autogyro, and the Japanese Army’s license production of this aircraft as the Kayaba Ka-1. They concluded that they would need three kinds of helicopters in the coming war at sea: a coastal chopper for use from shore bases, a compact shipboard model, and a mini-copter to be carried by submarines. Anton Flettner (1885-1961) was a successful engineer who worked for Count Zeppelin during World War I. His patents included a wind-driven ventilator fan that is still in production. After building several unsuccessful rotor craft prototypes, he won a contract in 1938 to produce a radically different helicopter, with twin intermeshing rotors set at a slight angle to one another. Driven by a single engine, the counter-rotating blades required a complex gearbox, machined and assembled with great precision. Although two were lost in flight testing, it proved so agile that none of the Luftwaffe’s best fighters could maneuver into firing position against it. The Flettner Fl 265 first flew in May 1939. It was considered “far superior” to Focke’s Fw 61. Although two were lost in flight testing, it proved so agile that none of the Luftwaffe’s best fighters could maneuver into firing position against it. An Fl 265 conducted successful takeoffs and landings on a 25-meter square platform built over a gun turret on the light cruiser Köln in the Baltic. Six prototypes were built, with one lost in a crash. No examples of the Fl 265 survived the war. An improved version of the Flettner was ordered into production in 1940 for the Kriegsmarine as the Fl 282 Kolibri (“Hummingbird.”) A few were completed with fully enclosed Plexiglas cockpits, but on production models the pilot’s seat was entirely open, with excellent downward visibility. The instrument panel in front of the pilot had indicators for vertical speed, airspeed, turn and bank, rotor RPM, rotor blade angle, and a compass. A small panel on the port side carried an altimeter, fuel and oil pressure gauges, oil temperature gauge, and ignition switch. The fuselage was constructed of welded steel tubes, with removable sheet metal panels around the engine, and fabric covering the tail section. Fixed tricycle landing gear made the aircraft easy to move with muscle power; taxiing under engine power was forbidden. An American designer, Charles Kaman (1919-2011), used Flettner’s intermeshing rotor concept for his K-225. 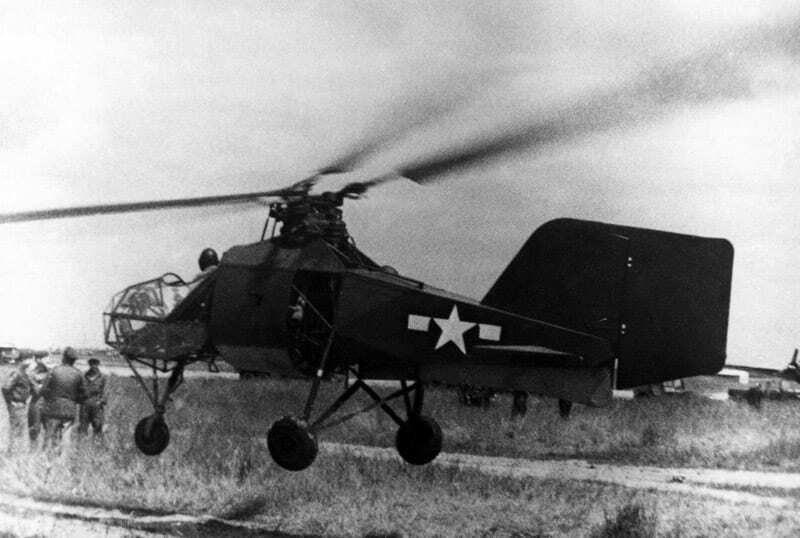 A version of the K-225 became the world’s first gas turbine-powered helicopter in 1951. Today, a descendant of that experimental aircraft, the Kaman K-Max, remains in production for civil and military applications, including an unmanned version that has undergone operational testing with the U.S. Marines in Afghanistan and with the U.S. Navy at sea. After 30 prototypes and 15 pre-production models were built, a thousand were ordered in 1944. Allied bombing raids repeatedly disrupted production, forcing the factory to relocate. Skilled workers proved impossible to obtain. By May 1945, only 24 had been completed. A few had enclosed Plexiglas cockpits, but most were open. About fifty pilots trained to fly it. One pilot and aircraft were lost at sea during testing on May 10, 1943. A few Kolibri flew operationally in the Baltic, Mediterranean and Aegean, mainly for convoy protection. The Flettner Kolibri was flown by both the Luftwaffe and the Kriegsmarine. Three survived the war: One is on display at the Midland Air Museum in Coventry, England. Another is reportedly held by the U.S. Air Force Museum in Dayton, Ohio, but is not restored or on display.